Static light scattering is widely used to measure the molar masses of molecules, particles and their aggregates under various solution conditions and compositions1. The ARGEN instrument has the capability to run 16 independent light scattering experiments simultaneously. It can monitor the change in both absolute Molecular Weight and Normalized Molecular Weight throughout aggregation or degradation processes. While this note exemplifies the use of ARGEN to characterize monoclonal antibodies, these methods and practices for monitoring and analysis are easily translatable to nearly all soluble synthetic and natural products. This technical note serves as a guide to conducting analysis using the ARGEN software to determine the Aggregation Rate of multiple samples as stressed under various thermal conditions. It is advantageous to make Arrhenius representations of Aggregation Rate for direct and vivid comparisons of stability for different formulations and under different stressors such as temperature and stirring. The Arrhenius Plot also yields Activation Energy over one or more thermal regimes. In this study, monoclonal antibody (mAb) was monitored in a set of 16 independent temperatures to determine the Aggregation Rate (AR) behavior. To eliminate as many variation factors as possible, the sample was prepared in a single buffer formulation at a fixed concentration of 1mg/ml. The temperature, however, was isothermally varied from 50oC to 80oC to test the molecule for thermal stability and determine the AR value at each isothermal condition. 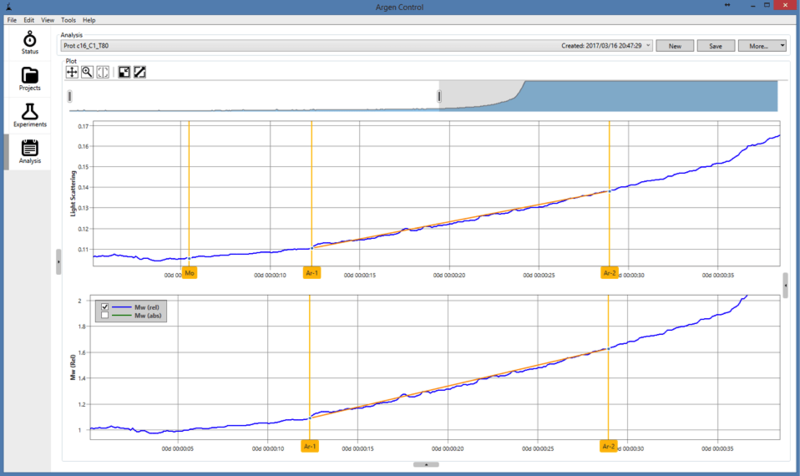 Figure 3 displays the analysis page of the ARGEN control software. The sample as shown, mAb: 1mg/ml_T=58oC, has a long linear aggregation profile over multiple hours. Selecting the initial scattering value as indicated by Mo normalizes the initial scattering to a value of 1, as shown in the bottom data trend. If there are no aggregates initially present, this initial scattering value, before any aggregation has taken place, is the scattering value of the native, undamaged protein. Figure 4 shows the analysis of scattering data for the 16th experiment in this study conducted at a temperature of 80°C. This scattering intensity qualitatively resembles an exponential increase in response to thermal stress. Here, it is particularly important to choose the linear portion of the data set before the non-linear behavior sets in. 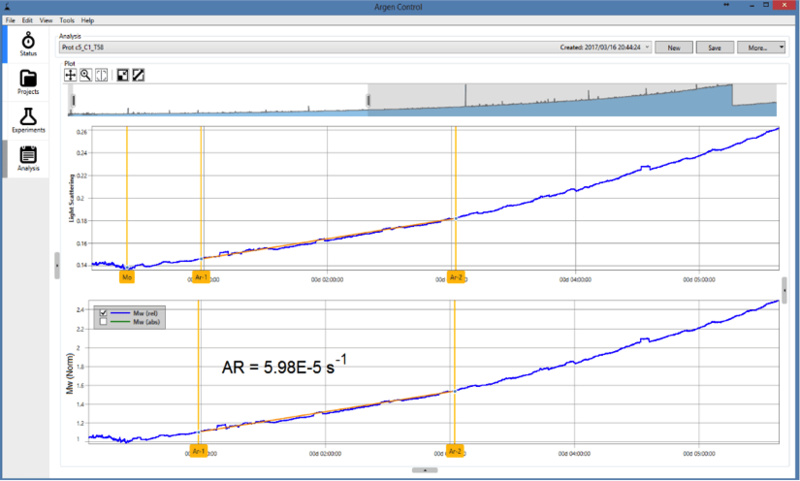 In this case, the AR Fit Residual as automatically determined by the ARGEN analysis software was 0.989. For samples that show this exponential like behavior, the linear portion is very early in the experiment profile. Figure 4 shows the entire data set while Figure 5 focuses on the appropriate analysis range. The ARGEN analysis software provides many user-friendly tools to aid in zooming and selecting the best Aggregation Rate data for each sample. The increase in light scattering from the initial Mo value is a direct representation of the sample’s aggregation profile. Selection of the linear regime by use of the Ar-1 and Ar-2 markers allows the user to easily determine the linear aggregation rate of change for the sample at that temperature. 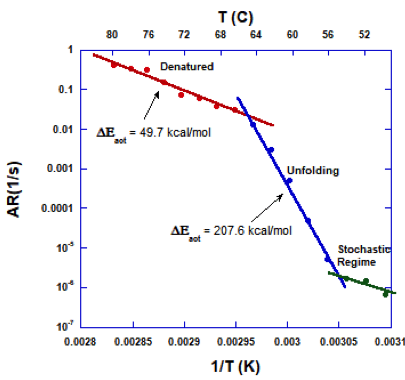 When characterized over several temperatures, it is easy to determine the thermally rate limited aggregation characteristics of the sample as it undergoes partial unfolding or full denaturation. A good means of visualizing the thermal behavior is through an Arrhenius plot, Figure 6. An Arrhenius plot is constructed by plotting the logAR (s-1) value for each experiment against the inverse of temperature, where the temperature must be represented in Kelvin; i.e. T(K)=T(oC)+273. The data are plotted on a log scale, since the Arrhenius plot is based on the notion of exponentially sensitive rates; i.e. where C is a constant with units of s-1,△Eact is the process activation energy, and R is the gas constant. Aggregation Rates vary by an enormous factor of over a million across a broad range of temperatures. (1 s-1 to 10x-7 s-1), and the Arrhenius representation gives a vivid means of comparing stability at different temperatures. The slope of log(AR) vs 1/T(K) directly yields △Eact/R, and since R is known,△Eact can be found. This allows for a direct comparison of the relative propensity to aggregate for various solution conditions. It is also known that as solution conditions change for a given biologic sample the aggregation pathway also changes. These relative differences are captured in direct comparisons of aggregation rates. It is important to note that the Aggregation Rate alone provides a clear indication to the stability of the protein and formulation of each experiment. A general interpretation insinuates that a low AR value is more stable than a high AR value when comparing multiple sample formulations under similar stressor conditions. Above, Figure 6 displays three distinct aggregation rate regimes. At temperatures below 54oC, Arrhenius behavior, as shown in Figure 6, may be lost and stochastic factors beyond just temperature may have a strong influence on aggregation rates. This makes it unreasonable to extrapolate the thermal stability of a protein sample at storage conditions based on the aggregation behavior from accelerated, high temperature measurements. Between 55oC and 65oC there is an Arrhenius regime where the AR is exponentially dependent on the inverse of temperature as shown in Blue. This equates to an activation energy of △Eact = 207.6 kcal/mol. This value is typical of many proteins. 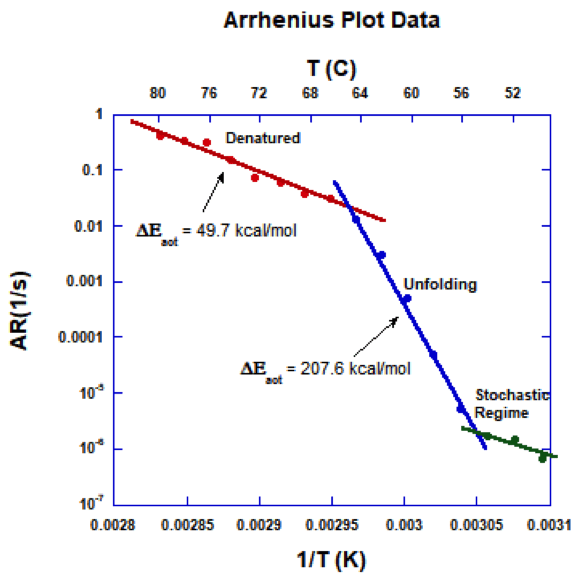 At high temperatures, 65oC and above, there is another Arrhenius regime with a much lower slope. This regime equates to an activation energy of △Eact = 49.7 kcal/mol. ARGEN allows quick, efficient analysis of multiple samples using SLS as a noninvasive method for continuous monitoring of aggregation for different proteins and protein formulations. 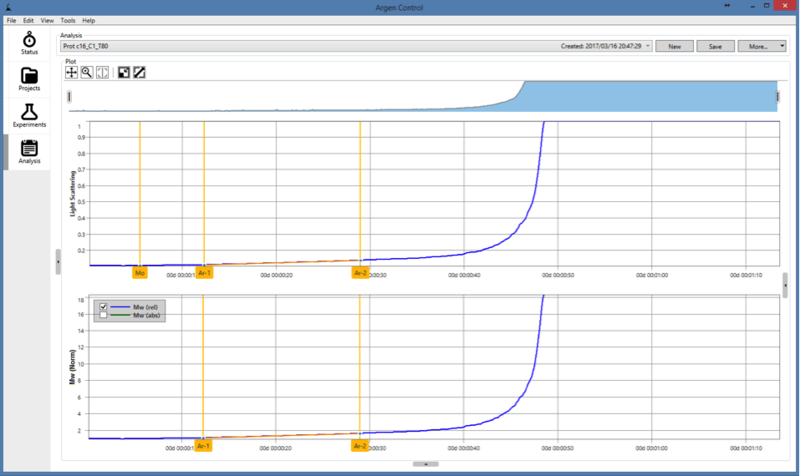 Aggregation Rate determination within the ARGEN control software gives a powerful measurement for quantitatively and directly comparing aggregation behavior across experiments within ARGEN studies. Additionally, further analysis utilizing the data generated by ARGEN reveals clear distinction of thermal energy regimes where Arrhenius behavior is observed. Kunitani, M., Wolfe, S., Rana, S., Apicella, C., Levi, V., and Dollinger, G., “Classical light scattering quantitation of protein aggregates: off-line spectroscopy versus HPLC detection,” Journal of Pharmaceutical and Biomedical Analysis, vol. 16, no. 4, pp. 573-586, 1997. Brummitt, R. K., Nesta, D. P., Roberts, C. J., “Predicting accelerated aggregation rates for monoclonal antibody formulations, and challenges for low-temperature predictions,” Journal of Pharmaceutical Science, 2011 Oct;100(10):4234-43. Drenski, M. F., Brader, M. L., Alston, R. W., Reed, W. F. “Monitoring protein aggregation kinetics with simultaneous multiple sample light scattering,”Analytical Biochemistry. 2013, 437, 185-197. Drenski, M. F., Brader, M. L., Reed, W. F., “Simultaneous Multiple Sample Light Scattering (SMSLS) for Continuous Monitoring of Protein Aggregation,” ACS Symposium Series, Vol. 1202, Schiel, J. E., American Chemical Society, 2015, Chapter 6, pp 159–188.